Oat Milk Belly Butter – Hippie Stink Soap Co.
Want to keep track of how we’re doing here? Want to talk shop with fellow fans? Like us on Facebook to get up-to-date info and catch updates, or follow us on Pinterest or Flickr to get pictures and ideas for your own crunchy projects. Want an ethical and honest place to source your soap from? Check out our store on Etsy! I’m about three months from giving birth and if there’s one irritation that I’ve been suffering from, it’s SUPER itchy skin on my belly! 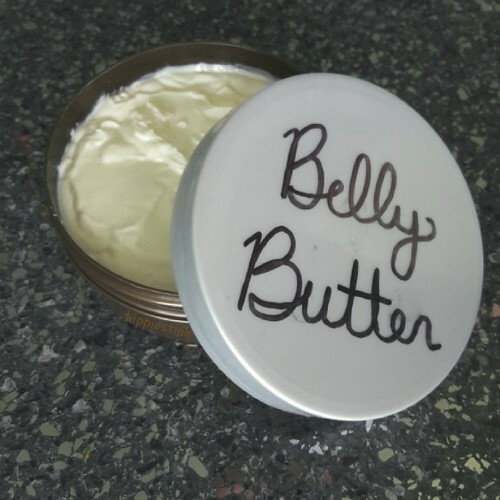 Most belly butters and body creams contain a lot of questionable ingredients though, so I decided to whip up some butter of my own. This recipe contains an amazing anti-itch blend of unsweetened oat milk, cocoa butter, and sesame oil to nourish skin and provide relief, as well as vegetable glycerin to help hydrate your skin. I have yet to get any stretch marks using this recipe in addition to drinking lots of water to keep hydrated! You can use a broad-spectrum preservative in this recipe to keep it from spoiling, but I use it often enough that I use it up before it has a chance. Storing it in the refrigerator will help a lot too. Melt wax, cocoa butter, and oil gently on low heat until melted completely. Mix glycerin and milk in another container and gently warm through. Using a stick blender, blend the oils on the lowest setting while slowly adding milk and glycerin. If using, add your broad-spectrum preservative at the recommended dosage and emulsify the lotion until a thick cream develops. Pour into a 200 ml bottle or tub to store. This butter goes on smoothly and soaks in fast. It leaves your skin super soft and touchable, not ever greasy. And because there’s so few ingredients it’s very safe for pregnancy! You can add your favorite essential oils to add a nice scent before emulsifying if you want, but this works great unscented as well.